Every boiler requires a complete replacement sooner or later. The trick to averting disaster is noticing the warning signs. You don’t want your boiler to suddenly shut down in the middle of winter. In this article, we’re going to show you some of the main signs of an impending boiler problem. It’s always important to know how old your boiler is. This will help to point any repairperson in the right direction. There are no hard and fast rules as to how old your boiler needs to be before it’s replaced. The problem is it largely depends on how well you’ve maintained it. 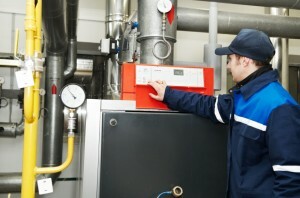 A well-maintained boiler, though, will usually require replacing after about twenty years. This doesn’t mean you should wait this long. Technology moves fast and you could be losing money by holding on to an old, inefficient boiler. Always be aware of the new boiler options available to you. One sign you need a boiler service is a metallic odor. Approach your boiler and smell the air. If there’s something wrong with it you should be able to notice a metallic smell. It could indicate any number of problems. It usually means the boiler has become defective and it’s starting to leak gas or oil. It’s not carbon monoxide, because it doesn’t have an odor. A metallic smell can increase the chances of carbon monoxide leaking out. Switch off the boiler and call a repairperson immediately. A malfunctioning boiler causes a lack of heat or no heat at all. Overheating is the main threat, in this situation. Most boilers have sludge deposits at the bottom of the boiler. This can cause the malfunction by clogging the machinery up. Again, this is a repair you need to make immediately. Before you do call, check the thermostat and the fuse. Boiler contractors commonly visit homes where the owner has forgot to turn the thermostat up or it’s a problem with their circuit breaker. Water leakage is a sure sign you have a boiler problem. It’s not an immediate issue, but it can cause a lot of damage if left to stand for too long. The obvious reason is the water pooling on the floor. It could soak through to the floorboards and rot them away. Water gathering at the stand of the unit will lead to additional fuel usage. You’ll use more fuel than necessary, which is essentially about wasting money. Sometimes you may approach your boiler and hear lots of strange noises. They often sound like clunking noises. An explanation for this is the iron deposits. These iron deposits lead to an incorrect distribution of water. An incorrect distribution of water may result in complete system shutdown or overheating. Turn the boiler off and call a repairperson straight away. Never wait until you have to call your boiler company. If you wait for problems to take hold, you’ll always pay more for repairs. Catch the problems early and you’ll have to pay to repair additional damage. But what about if you happen to have a warranty? You won’t have to take into account cost considerations. You do need to think about safety considerations. A malfunctioning boiler does have a small risk of exploding. One wrong move could cause serious damage to your home and people in the vicinity. Even if you’re unsure as to whether there’s something wrong with your boiler, call a professional. Most companies offer free callout options if you suspect there’s something wrong. Interesting article….two words ….heat pump….In my neck of the woods home heating oil has went nuts….north of $4 per gallon. Add to this the high cost of maintenance…like $350-400 for a service policy per year. And on top of that a boiler carries only a 20 year life? I learned quite a bit about this first hand when I got pricing on a replacement for my 1929 coal converted to oil boiler…over $8K for new boiler with old furnace removal…no thanks. My solution? Scrapping the radiators and old furnace….and installing electric baseboard heat as well as added insulation and caulking. The install is cost effective and though considered pricey $8k buys a lot of electricity and there will be no $400/year maintenance fee or $4 per gallon oil. To be fair this will be supplemented by wood burning fireplace insert which should soften the blow some what of the electric heat….. I didn’t realize that you could actually smell when your boiler need repairs. I do wonder what causes the metallic smell in the air though. Regardless, I imagine that it is quite the immediate sign that something has gone wrong and that your boiler needs help. I agree, if you can see your boiler leaking water than it is definitely time to call someone to repair it. After all, the boiler isn’t going to be able to do a very good job if it is constantly leaking the water it should be heating. It’s best to call for a repair technician as soon as possible so that you aren’t wasting to much water while you wait.